Portobello mushrooms are simply a maturer version of the familiar white button mushrooms you will find at the supermarket. Big, meaty and delicious, they have become a sought-after delicacy. Portobellos, like all mushrooms, reproduce using spores rather than seeds. If you are collecting spores to try and grow your own, keep the mushrooms and spores as sterile as possible. Spore prints are beautiful and can be used to create natural works of art as well. 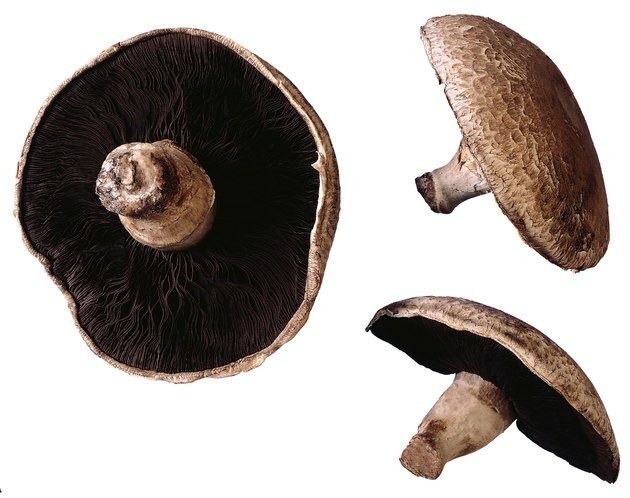 Portobello mushrooms have brown gills and produce brown spores. Choose mushrooms that are still convex or domed on top. Mushrooms that are flat topped or concave may be too dry and over-ripe to produce spores. The underside of the top is filled with little ridges called gills, and these produce the spores. They should still appear moist; if they look dry, they will not emit spores. Cut or pull off the stem and discard. Place the mushroom, gill-side down, on the paper. Cover with the glass bowl and leave for 12 to 24 hours. Remove the bowl and mushroom carefully. The mushroom will leave behind an intricately patterned spore print. If you are harvesting for cultivation, use a pipette to draw the spores up off the paper. If you are creating an art print, spray lightly with a fixative, possibly building up a couple of layers to keep the spores secure.